The great thing about chili is that it’s a one pot meal, and can be prepped in minutes and set on the stove to simmer without worry. 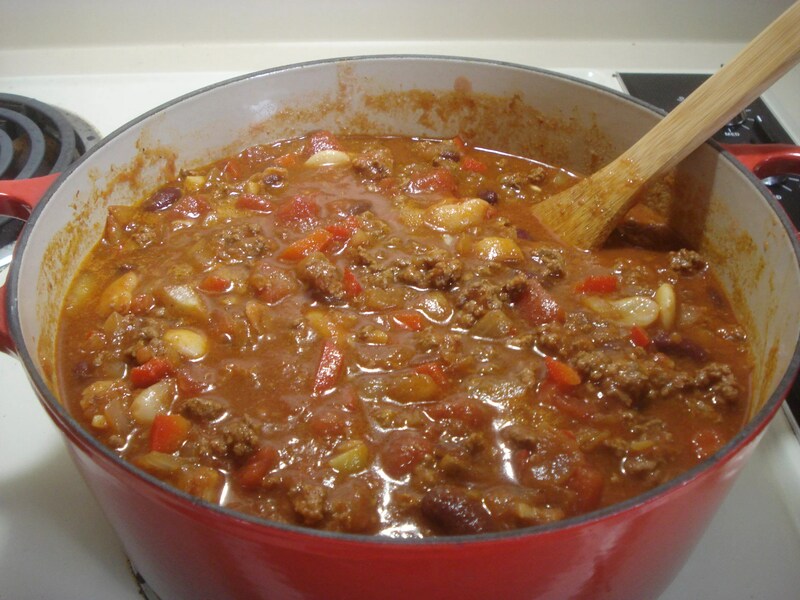 This recipe is my all-time favorite chili. Not too spicy, with a nice chunky texture of the vegetables and meat. It’s a basic chili, but a great one. Try this and share it with your friends. And don’t forget the Ritz. Heat the oil in a large Dutch oven over medium heat until shimmering. Add the onions, bell pepper, chili powder, cumin, cayenne and 1/2 tsp. salt. Cook until the vegetables have softened, about 7 minutes. Stir in the garlic and cook for 15 seconds. Add the beef and increase the heat to medium-high. Cook, breaking up the beef with a spoon until no longer pink, about 10 minutes. Stir in the beans, diced tomatoes with their juice, tomato puree, and 1/2 tsp. salt. Bring to a simmer, cover and cook for 45 minutes. Remove the lid and continue to simmer until the beef is tender, about 45 minutes. Stir in frozen corn, if desired. Serve topped with cheddar cheese and sour cream. This looks pretty good to me, and well within my cooking abilities. Is it really “not too hot” with all that cayenne? Can you swap the beef for turkey without changing anything else? It really is pretty mild. I’m not one for spicy food, and this is the perfect heat for me. If you wanted to make it hotter, you would just add more cayenne. And yes, you could substitute ground turkey for the beef. That would be delicious and healthy. I think I’ll try that next time! I am always looking for a good chili recipe and this sounds delicious! After reading this and the “pasta wars” entry, I was wondering if you ever tried chili over spaghetti? There’s a restaurant chain in the Mid-West called Steak ‘n Shake that serves it that way.I have also seen it referred to as Cincinnati Chili…anyway, it might help winner over your non-pasta lover! I’ve made this a few times now – though I think I add a lot more beans – black, pinto, kidney – as well as corn. It makes WAY more than the chili eaters in my house can eat, but I freeze half of it and the other half last 3-4 days. I have not tried it over spaghetti, but I do eat it over elbow macaroni with cheddar cheese (Yes, just like at Steak and Shake). I’ll also eat it over hot dogs or just plain with crackers. Any other ideas? I think Cincinnati Chili is different. It either has chocolate or cinnamon in it. Not sure which. Still, it might be served over noodles. I have heard of people putting over spaghetti, but have never tried it…I just may do that! I also add more beans than the recipe calls for. I love butter beans, so I add those. I also love adding frozen corn. My very favorite way to eat it is with plenty of cheddar cheese and sour cream, dipping Ritz crackers in. Glad you’re enjoying the recipe. It’s one of my favorites.